The servant who owed a tremendous debt said to his Lord, “Have patience with me and I will pay thee all.” But when forgiven he did not want to express that same patience to a fellow servant. Instead, with anger he cast him into prison. So all of us want God to be patient with us, but we don’t always want to give that same patience to others. Impatience and anger are like sister sins, with one leading quickly to the other. 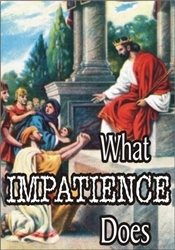 If you develop patience, you are far more likely to not sin by getting angry. The biggest problem parents have in raising children is not the children. It is the parents’ own impatience & anger. Impatience produces anger, bitterness, and unforgiveness. It demonstrates a lack of true love. Impatience cuts you off from the blessings of patience, while increasing the number of your trials. This message also gives seven steps to develop patience.